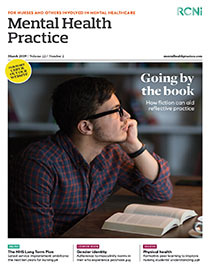 Aim Reflective practice is essential in the development of autonomous, critical and advanced practitioners, and can positively affect nurses at all levels. This study aimed to evaluate nurses’ experiences of participating in reflective practice sessions in a medium secure mental health service. Method Data were gathered over four months in 2013, through semi-structured interviews with eight nurse participants. Results Analysis revealed four themes – nursing growth, unsafe terrain, unmet needs, and a sense of direction and improved practice, which comprised both positive and negative elements. Conclusion To the best of the authors’ knowledge, this study is the first of its kind and contributes to the evidence base on reflective practice. Reflective sessions, although useful, are not always used effectively because of nurses’ concerns about psychological safety in the group and because of lack of staff. Better education about the aims, objectives and nature of reflective practice might improve nurses’ engagement.